A portrait of a woman slowly losing her mind, Arleen Solomon Rotchin's third novel achieves the perfect balance of comedy and tragedy. Arleen Solomon Rotchin grew up in Montreal and Miami Beach, where she majored in journalism at the University of Miami. She then studied photography and eventually received a Certificate in Phototherapy. Her passion for photography has led her to many projects -her portfolio on Old Age was published by Canada Camera. She has also contributed her talent to two Montreal Colleges; having designed and taught a Youth Photo Program at Dawson and guest lectured at Vanier. During the International Child-Youth Care Conference, she was a panelist for a discussion on the Therapeutic-Creative value of Photography for kids in care. 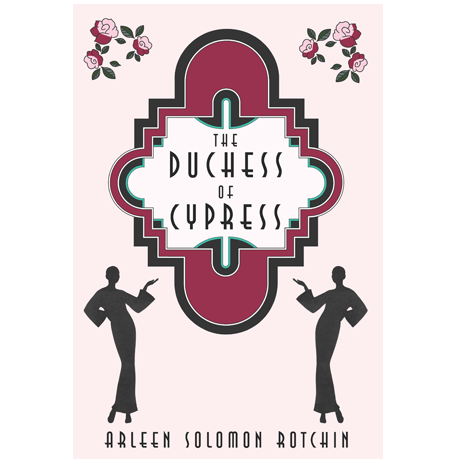 She has written three novels: ‘Sam’s Will’, her best-selling memoir; ’ Zoo’, where she combined her interests in phototherapy and writing, and the upcoming ‘The Duchess of Cypress’. See what people have to say about Arleen Solomon Rotchin’s books. "...a compelling read...Rotchin has a great eye for detail and this imbued with her sense of humour provides an engaging backdrop to her accounts of dealing with Hasidic businessmen, to tackling the many lawyers and lawsuits associated with Sam's will and to her interactions with the privileged of the Palm Beach community. The real message here is that being an executor of a multi-million dollar estate may sound intriguing - but the reality is fraught with those basic human emotions: mistrust, suspicion, greed, and ultimately grief. What is encouraging is how Rotchin manages to face those demons and survive, somewhat wiser and clearly empowered. For anyone facing the entanglement of inheritance issues now or in the near future, this is a must-read. For those of us who love a well written story that takes place in Montreal - don't miss it!" "The author's segue from the abrupt closing of her father's estate into three moments, a visit to the dentist, a morning at Alexis Nihon Plaza in Montreal, and a Water Taxi trip down the Intercoastal, replays and refines the opening theme: "This is our last day of Shiva. In a few hours we will be taking our walk around the block, signifying our return to daily living...we'll do a ceremonial walk around the block and like a well-rehearsed troupe, on the count of three, toss our mourner's raggedy necky-things into the wind, symbolizing the escorting of a soul departed and signifying our return to daily living... It's a symphony in print and, like a richly textured piece of music, the notes linger." Choose from Arleen Solomon Rotchin’s three novels to read a titilating excerpt. A couple of years ago in the month of February around my 80th birthday, I said to myself, Evelynn, it’s enough with the standing on your feet and just like that in the blink of an eye, I handed the keys to the boutique over to my son Stephen and his wife Sue Ellen who have worked beside me in the business for thirty years. You could say I’m on the back burner now and they’re managing just fine without me while I’m enjoying my retirement in Palm Beach, Florida. I’m not the type to sit around gathering rust. I keep busy. I belong to a book club in our building and I go to the Breakers Hotel for lunch. Men still fancy me. I date. Why not, I’m not dead yet. Most of my neighbours are pleasant and friendly. The Toucher is not. Lately, someone has been jiggling my door handle trying to get into my condo. I suspect it’s the Toucher who lives on the fifth floor facing the pool, the one who stole my boyfriend and goes around touching people as she speaks. She can’t speak unless she touches. Her mouth begins to move and right away her hand shoots up to reach out and touch. Some people spit when they speak. She touches. Dollars to doughnuts, I’ll bet it’s her fiddling with my door handle. Montreal. Two things happen. One nice. One not so nice. The not so nice is a phone call from Geena’s friend Flora. I tell her yes I can hear her and I don’t know about Canada, however, Montreal is glorious. Flora’s voice is resonating, an octave between weeping and her real estate pitch, somewhere in the Mezzo Soprano range. Flora also mentioned that the newspaper reported that Geena had been sentenced for twenty-four years. I think she meant twenty-four months. Since my last visit, there is more graffiti on the elevator walls in the Company Building. Up, up, up, get me to the fifth floor, to the management office, please God, without this shaking box snapping off and plunging to the boiler room and parking garage in the basement. Workers keep getting off and on, off and on, beer bellies, staccato talking, moving in and out of Italian, Greek and French. Where are they headed? Third floor, fourth floor, finally, finally the fifth floor, the management office, take a breath now, breathe, breathe. There is a mezuzah attached on the management doorframe identifying the premises as Jewish territory. Following the Jewish custom, it is mounted on the right outside doorpost about one-third of the way from the top of the frame, angled somewhere between horizontal and vertical. The management office blessed. Through the glass door, I see the Hasidic in his black hat quarantined behind the reception counter. He has a stunned look on his bearded face when he sees me. His light blue eyes are not twinkling. I am happier to see him than he is to see me. The door is locked. He buzzes me and I say “Shalom”. He gives me a meek shalom back but does not move from behind the counter where he is safe from tenants who come to complain about overflowing toilets, power outages, heat, air conditioning, flooding, immobile elevators, mice, and now me. He remains safe from my hand touching him. He nervously utters shalom again and asks me what I want. “I’ve come to work in this office,” I tell him, smiling. “You cannot come into this office.” He is speaking to me as if I was a child and he is not smiling back. I may be tall for my generation, but this little man is short. He must have to stand on his tippy-toes to kiss that mezuzah on the outside doorframe. “Excuse me?” I glare down at him. He repeats himself. “You cannot come into this office.” His voice isn’t so meek now. “No.” A very quiet ‘no’. “Well, from now on you had better pretend that I am Sam Solomon.” I smile and walk around the counter into his space. Whether you need to complete your collection, or want to get a copy for a friend, you can buy any of Arleen Solomon Rotchin's three titles in paperback by clicking below. Now you can take all three of Arleen Solomon Rotchin’s captivating and entertaining novels wherever you go. Sam Solomon dies, leaving a multimillion-dollar estate and a bombshell for his daughter, Arleen — she and her three young sons are to be the executors of his will. Dumbfounded but proud to have been chosen, she takes on the job, never dreaming it will mean thirteen years of playing “this rough sport”. Her sense of humour prevails in this memoir of how she struggles to settle the estate according to Sam’s Will. Evelynn, a feisty octogenarian and Montreal’s doyenne of retail fashion for five decades, hands the keys to her boutique over to her business partners and retires to sunny Florida. Arleen Solomon Rotchin, bestselling author of Sam's Will and Zoo, draws us into Evelynn's crazy world. She introduces us to a smorgasbord of colourful characters living in a Palm Beach condo building and amuses us by giving us a glimpse into how things work in the imaginative mind of Evelynn. Narrated by a quirky Montreal photographer, Zoo is an intimate portrait of a friendship between two women, an unexpected incarceration, and a group of ‘at risk’ young boys who give an entire new layer of meaning to life’s choices. Arleen Solomon Rotchin, bestselling author of Sam’s Will, takes us to Palm Beach, Florida, looks through her viewfinder and with off-beat humour focuses on the chaos. Arleen Solomon Rotchin | All rights reserved.